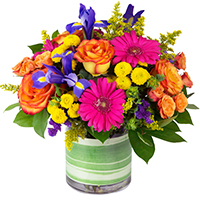 Cheery arrangement in bright colors with roses, irises, gerbera daisies, spray roses, button pompoms, statice, solidago aster, bupleurum, and salal. 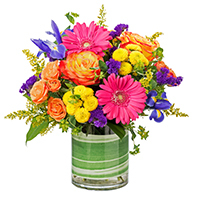 The vase is lined with special striped ribbon that looks like a variegated aspidistra leaf and keeps the water fresher without real underwater foliage. 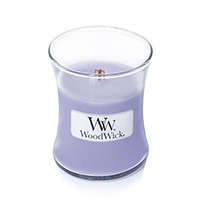 Clear glass cylinder measures 4"W x 6"H (Standard), 5"W x 5"H (Deluxe) and 6"W x 6"H (Premium). 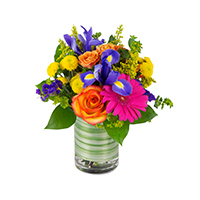 Your arrangement is handmade by a skilled designer; contents, dimensions and vase may vary.